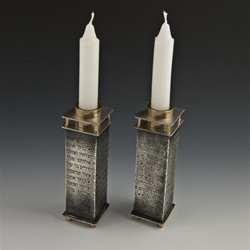 To welcome Shabbat at least two candles should be lit, representing the dual commandments to remember and to keep the sabbath. On these candle holders that prayer is embossed. The finish denotes antiquity and the shape shows the essence of contemporary life.